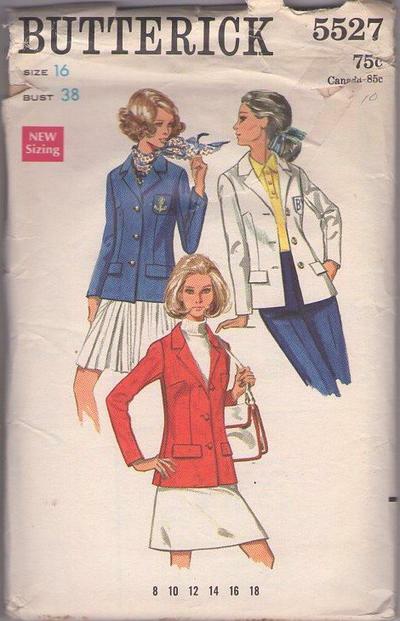 Bust 38", Waist 29", Hips 40"
60s Career, Retro Outerwear Clothing Patterns - MISSES' JACKET Semi-fitted jacket with notched collar and wrist length sleeves has upper patch pocket and low pockets with flaps. Optional purchased emblem or monogram. Purchased sweater, blouse and scarf. CONDITION: This Original Vintage Sewing Pattern was cut & used. All pieces appear to be complete and intact and have been neatly refolded with the original instructions. Envelope has upper edge wear & some tape.